On the heels of another rowdy, inspiring China Children’s Book Fair in Shanghai last week (November 9–11), it is my pleasure to offer you this post-show report—wherein, I’ll provide details of the fair, a brief overview of the children’s book market in China, and news of our plans to continue representing titles at international book fairs. In 2019, the Foreword Indie Press Collective is scheduled to attend subrights events in Bologna, Frankfurt, and Shanghai. 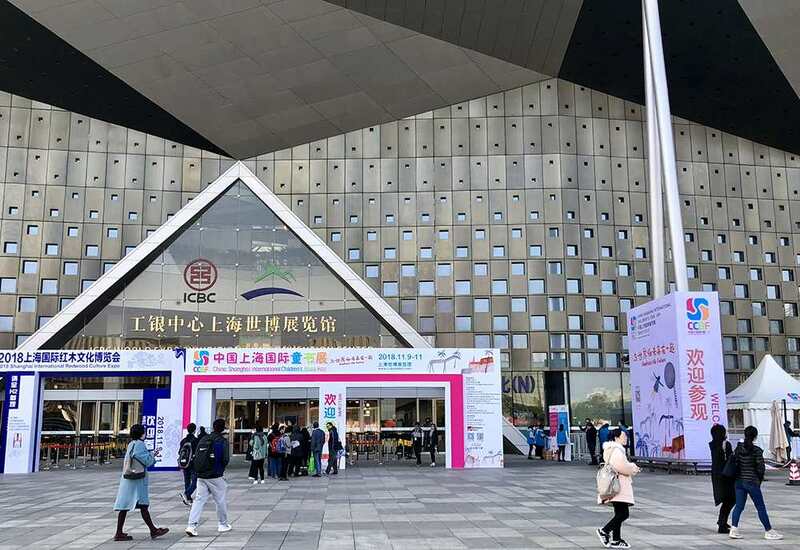 For the sixth straight year, the China Children’s Book Fair held court in this dynamic, tidy, architecturally stunning city. Flaunting several of the world’s tallest buildings, an amazing riverfront, and what can only be described as a futuristic feel, Shanghai is definitely one of those must-see places. Unlike Beijing and most other cities in China, Shanghai is not especially difficult for Americans to navigate—from the cleanliness of the taxis and subway cars to the English found on street signs and shopfronts to the astounding number of not-terribly-expensive Western restaurants and innumerable reasonably priced, very good Chinese restaurants, only the most timid traveler might find the city intimidating. Yes, it’s incomprehensibly large, but the average cab ride to most parts of the city is no more than thirty minutes and priced in the $6 to $10 range. Even better, the subway system is vast, easy to use, and less than 50 cents a trip, even if, during rush hour, the individual train cars pack in more people than the population of Wyoming. Furthermore, a fairly high level of English is spoken in most markets, retail shops, and restaurants frequented by Western travelers, and each year Shanghai’s English fluency gets better—especially among hotel front desk staff and concierges. Yes, the city’s smog is concerning but emissions seem to be trending downward due to control measures. In our experience, the smog is not bad at all—it certainly has never kept us indoors or caused us a bout of coughing. Fourteen hour flights and the thirteen hour time difference from Eastern Standard are the two factors that makes Shanghai a drag. My wife, Victoria (Foreword’s founder and publisher), and I always arrive three or four days early to adjust and even that amount of time isn’t enough to feel 100 percent by show time. Our usual routine upon arrival is to take long walks to various neighborhoods and landmarks around the city—not only to get some much needed exercise, but also to keep ourselves from taking naps. Every hour slept during the day, is one less hour you’ll get that night. Lastly, let’s not forget to mention that Shanghai is one of the world’s great towns for shopping, but you knew that already. As you may be aware, there is an August book event held in Beijing that focuses on adult books and educational titles. The late-autumn Shanghai CCBF event was created to spotlight children’s books in the Asian marketplace, and to serve as an off-season counterpart to the Bologna Children’s Book Fair held in April every year. You can imagine the industry’s surprise, then, when it was announced in late 2017 that the BolognaFiere was now playing a “co-organizer” role with the Shanghai fair. “Pleasantly surprised” might be a better way to express the book-industry’s reaction. Not that the original Chinese owners didn’t run the event well, it was more a matter of bringing some international heft, along with some marketing savvy. Specifically, everyone wanted to see more international exhibitors, especially from North America and Europe. So how’d the Bologna team do this year in Shanghai? 2018 saw the number of exhibitors increase to 367, with an equally great jump in the number of attendees to more than 33,000. As we’ve reported before, approximately 80 percent of the books sold in China come from content produced abroad, the country has 375 million kids under the age of eighteen (English is widely taught), and income levels amongst the middle class are stable. There’s no doubt that the Chinese appetite for children’s books is huge, and the market seems only to be growing. In fact, the Chinese children’s book segment grew by 14.2 percent in the first nine months of 2018, with sales over $10 billion, accounting for 25 percent of the country’s total book market. 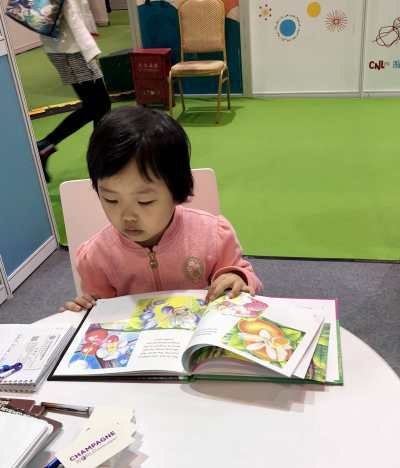 Is it any wonder the Shanghai Children’s Book Fair is on the radar of children’s book publishers from all continents and corners of the world. As twenty-four-year veterans of international book fairs in England, Germany, France, Italy, Russia, USA, and China, Victoria and I feel like we seen the full gamut in bookshow attendees—from the cutthroat business types who only see books as units to the look of irrepressible delight you see on the faces of those lucky people who simply love to be in the company of books. China definitely produces more than her share of the latter type. Western images, famous movie and children’s book characters, and even the simple matter of English words on book covers drew visitors inside the Foreword Indie Press Collective which, once again, was part of the Children’s Books USA stand. Over the course of the show’s three days, many hundreds of Chinese attendees slowly worked their way over the CBUSA shelves, pointing at individual letters on covers, sounding out English pronunciations with their lips, most of them unable to contain feelings of open-mouthed wonderment. For many, it’s not only English as a second language, it’s English as a special fascination. Just a few weeks off the massive, ultra-professional Frankfurt Book Fair, CCBF is a quick cure for book fatigue. Sophisticated, artful children’s picture books and basic education titles are usually the primary lead-generators at our stand in Shanghai. As a rule, books with superb artwork earn the most attention and touches from passersby. We’ll say it again, great art is crucial to a book’s success in the foreign rights marketplace, regardless of the country. As it relates to content, themes supporting good morals, common courtesy, bullying, sharing, friendship, and learning disabilities ranked high on the demand list at this year’s CCBF. A high number of inquirers asked whether individual books were part of a series and many wanted more info on the award seals featured on some of the front covers. If there’s a takeaway from this paragraph, children’s book publishers need to prioritize art and design as much as writing and content. 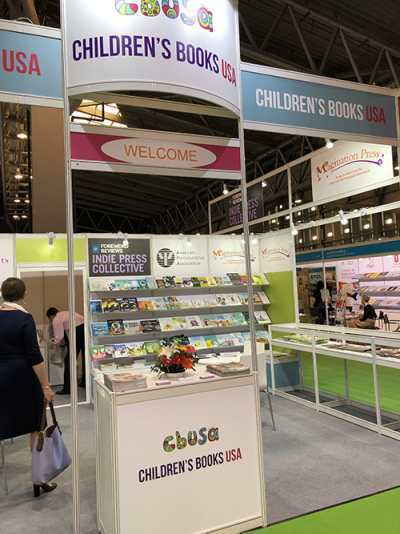 A subsidiary of Foreword Magazine, Inc., Children’s Books USA (CBUSA) is a thirty-two-year-old concierge service for larger children’s book publishers at the Bologna Children’s Book Fair. This means we host a number of more established independent and larger children’s book publishers at our stand, taking care of the details like shipping, setup, and coordinating with organizers. Our job at CBUSA is to make it as easy as possible for publishers to show up on the opening morning of the show and immediately get to work. As you might imagine, Children’s Books USA has incredible brand recognition in any language, and particularly at the China Children’s Book Fair where we were the largest presence (in terms of square footage) from the United States. As in past years, we contracted with an extremely talented local designer to create an eye-popping booth for agents and publishers to browse with two tables for meetings and a front-of-stand counter to handle inquiries. Our stand was so attractively designed, dozens of attendees posed for pictures in front and on all sides. This year, the American Psychological Association’s Magination Press joined us in the CBUSA stand and, with several shelves of acclaimed books, certainly added to our booth’s foot traffic. Also, RightsMix’s Rebecca Mancini maintained a large presence in the CBUSA booth. In years past, most Chinese book-rights deals were made through a small handful of Chinese agencies. Two of the largest agencies, Big Apple Agency and Bardon Agency, still handle rights for the majority of not only large US publishers but also many European publishing houses, and focus mainly on selling the rights of bestsellers. Fifteen years ago, the chances for independent presses and self-published authors to land a significant deal were slim. The situation has changed in recent years with several smaller agencies succeeding in the rapidly expanding market. The Shanghai fair also facilitates a matchmaking opportunity for Chinese agents and publishers to book meetings directly with incoming international exhibitors. Representatives from some of the largest and finest publishing houses in China paced the show floor along with thousands more trade visitors (publishers, editors, distributors, designers, movie companies looking for animation projects, booksellers, librarians, printers, you name it). To us at the CBUSA stand, it felt like every single CCBF attendee stopped by our booth. In addition, we had visits from European and Asian agents and publishers. Based on show floor traffic, the Chinese book publishing industry seems to be at least 80 percent female, with an average age of thirty. As an American collective stand, we couldn’t help but notice (and envy) the large collective stands representing publishers from Korea, Australia, France, UK, Iran, Russia, Spain, and other countries. Their respective governments subsidize the renting of booth space, building an attractive stand, and other expenses associated with attending the book event. In reality, they’re all competing for cultural attention—hoping to showcase their people and culture in compelling ways through the books they publish in their country. The French contingent of publishers, for example, was supported by five governmental agencies including: Centre National Du Livre, Institut Francais, Ambassade de France en Chine, Air France, and Faguowenhua.com. Every year, the number of UK publishers grows by six or eight publishers, and the Koreans were promoting a grant program to pay foreign publishers a $2500 stipend to help foreign publishers offset the translation costs of Korean books being purchased and published in other countries. We are just beginning to collate our list of leads and will begin contacting individual publishers with specific requests for review copies from interested visiting agents. This list has been through a vetting process that is a step further than we are usually able to provide post show. We also shared our ecatalog and handed out copies of Foreword Reviews. Historically, scores of publishers are contacted after the fact through the ecatalog and magazines we distribute. Also, a word on China copyright issues: While counterfeiting and pirating of trademarked and patented goods remains a serious problem in China, improvements continue to be made (membership in WTO, amendments to copyright laws, etc.). At the end of the day, does China provide adequate and effective intellectual property protection? Most experts would answer “no” to that question and we highly recommend you work with a trusted foreign rights agent, and with co-agents in China who know the marketplace and the players. It is clear that China’s book market continues to grow, and when you think about the sheer number of people (hundreds of millions) anticipated to become English readers in the next decade, you can’t help but be enthusiastic about the publishing opportunities. From our experience, the driving force behind publishing in Asia continues to be English as a Second Language (primarily through children’s picture books), followed by education, business, leadership, and self-help titles. In addition, new doors are opening for fiction on portable devices, also contributing to ESL efforts. For children’s picture books in particular, as well as young adult fiction and nonfiction titles, we strongly believe CCBF will increasingly assert its role as the Asian center for the exchange of sub rights to books. For independent presses in particular, it is an excellent venue to begin a rights program if you don’t have one in place. Next year, we will be exhibiting again in Shanghai with premium space already reserved through CBUSA.